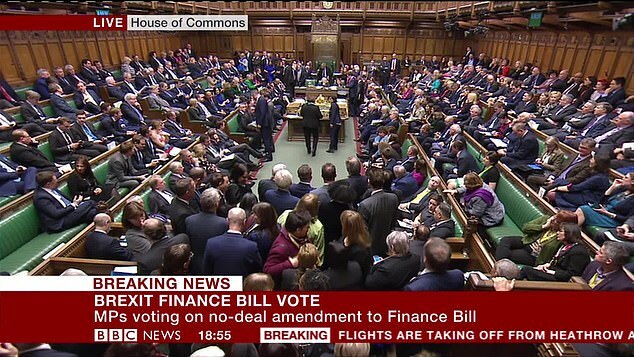 Although the Chamber was full at 7pm for the vote (which the Government lost), there were not many in the cocktail hour-ish when Yvette Cooper began her speech to tell us she was ‘really worr-eed’ about Britain galloping out of the EU without a deal. ‘Crashing’ out is the term Europhiles employ but I prefer ‘galloping’ for its buccaneering, blood-quickening qualities. Let’s be cheerful. Let’s be excited about the prospect of liberation from those beggars in Brussels. All this graveside keening about Brexit is so ruddy gloomy. Miss Cooper fretted that a no-deal Brexit could increase import costs. Sir John Redwood (Con, Wokingham) argued that once we were back in charge of our own import taxes, we could make goods much cheaper and that would make our manufacturing terrifically competitive. Miss Cooper did not much like that suggestion. Instead she was ‘really worr-eed’. When she says that she does a little frown and pinches the vowels and blunts the consonants to convey her goodness. She assumes an earnest purity that has been honed over many years as a member of liberal London’s crack regiment. She is, after all, the consort of Ed Balls. She was also once a domestic policy specialist working with – we do not say under – Bill Clinton. ‘Domestic policy’ for bonking Bill. Yikes. I bet he never dared lay one of those long, bony fingers on the sainted Yvette. Her frown and that pronunciation yesterday told the House this: I am a good person; I am more in tune with morality than you; I am one of life’s kindergarten teachers and you voters will please obey me or I will tell your mummies and daddies that you have been naughty. She explained that it was not ‘unpatriotic’ to try to reduce Theresa May’s negotiating leverage. No! It would have been unpatriotic of her to do anything else. Around her sat a knot of like-minded Blairites, clucking. ‘Yup, yup,’ came egg-house squawks from the likes of Chris Leslie and Angela Smith and that over-emphatic hen Rachel Reeves. On the Tory benches, Miss Cooper’s speech was heard with similar enthusiasm by the likes of Nicky Morgan (Loughborough), staring wildly. Ditto Sir Nicholas Soames (Mid Sussex), Sir Oliver Letwin (W Dorset) and Edward Vaizey (Wantage), currently wearing a beard that looks as if it could do with a squirt of Harpic. They and a few of the usual suspects – Boles, Wollaston, Heidi Whatnot, mega-rich Djanogly and Monsieur Le Sexpot Grieve – had signed Miss Cooper’s amendment. Ma Soubry was in, as ever, twitching, avian, pushing out her lips, a trombone player preparing for a blast. Charlie Elphicke (Con, Dover) suggested Labour should be ‘more responsible’ than trying to stop our Government preparing for a no-deal Brexit. ‘Oh, rubbish!’ shouted some of Miss Cooper’s friends – the very people who earlier had been insisting that free speech must be preserved and nobody should be shouted down during the coming weeks. That had come during another long bout of moaning about members of the public heckling Miss Soubry outside Parliament on Monday. 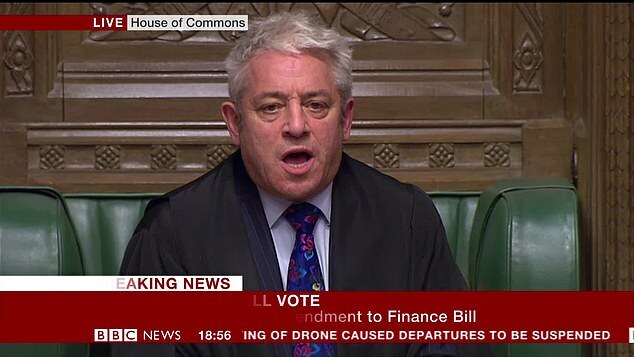 Speaker Bercow, himself so often a faucet of bile, sprayed us with another of his homilies about how ‘aggressive, threatening and intimidating behaviour’ was despicably wrong. ‘It is a type of fascism,’ said Bercow, wildly simpliste, about the protesters who had given Miss Soubry some what-for. Is it really fascism? Or is it just inevitable public anger – which could increase – at the spectacle of a Remainer Parliament which is plainly out to stop our kingdom regaining its independence? For that is what last night’s vote will look like to the public. And they will not be wrong.